Recommendations to improve the sustainable management of fisheries using Fish Aggregating Devices (FAD) in the Caribbean. Developments related to billfish management resulting from the last meeting of International Commission for the Conservation of Atlantic Tunas (ICCAT). Progress on the ongoing circle hook trials taking place in Grenadian longline fisheries. Ongoing fisheries data collections and legislative improvements in the Dominican Republic and Grenada to support effective fishery management. Outcomes from Fishery Performance Indicator (FPI) studies in the Dominican Republic and Grenada. Results from a Willingness to Pay (WTP) study demonstrating recreational angler support for enhanced billfish conservation efforts. Processes for business cases to invest in the conservation and management of billfish in the Caribbean region. Endorsement of a study to review and refine growth parameters used for Atlantic billfish stock assessments. 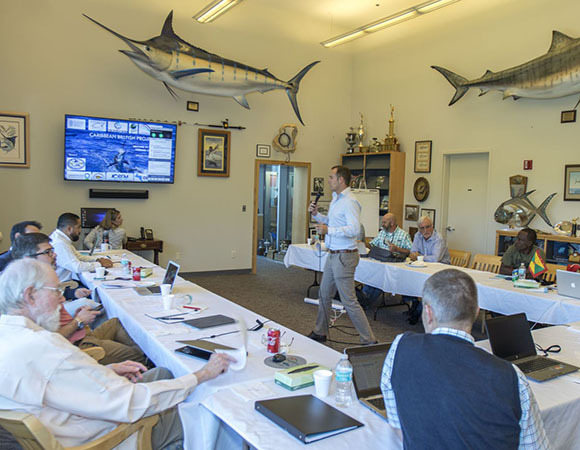 The purpose of the CBMC is to provide technical and scientific advice to the CBP, which aims to develop business plans to create sustainable management and conservation of billfish within the Western Central Atlantic Ocean. The CBMC is comprised of IGA, FAO/Western Central Atlantic Fisheries Commission (WECAFC), Conservation International (CI), The Caribbean Fisheries Management Council (CFMC), The Caribbean Network of Fisherfolk Organizations (CNFO), The Caribbean Regional Fisheries Mechanism (CRFM), and The Central American Fisheries and Aquaculture Organization (OSPESCA). The meeting was funded by the Caribbean Billfish Project under the Common Oceans ABNJ Project on Ocean Partnerships (OPP). The overall OPP is funded by the Global Environment Facility GEF, implemented by the World Bank and executed by the WECAFC.